Back in 1957, guitar players didn’t have many things to choose from as far as amplification went. Guitarists playing in smaller venues found little to no sound reinforcement [Editor’s Note: not much has changed! ], and had a great need for a grab-and-go,low-wattage, clean sounding, amp with multiple inputs for both a mic and a guitar. Most designs were basically low watt combos (compared to todays standard 50W and100W behemoths) with the simplest of features. Forget about effects loops—the first effects pedal wasn’t released until 1962, anyway. 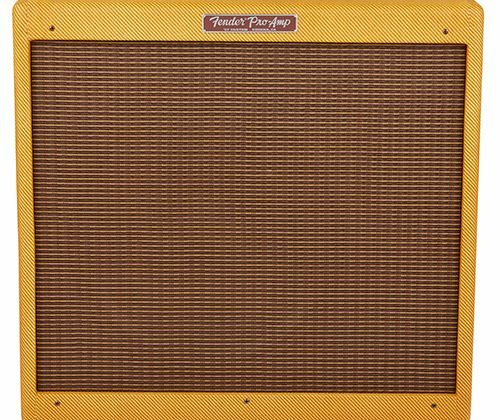 But for clean amplified tone, one extremely popular amp was the tweed 1957 Fender Pro Amp, a low-wattage, hand wired affair… and Fender has faithfully reproduced this classic in the form of the Fender ‘57 Custom Pro Reissue, right down to the point-to-point construction. Fender’s classic 5E5-A circuit has been faithfully recreated in the Fender Custom ‘57 Pro Reissue, and after spending a couple of months with this tone monster, it’s easy to see why the amp is coveted by purists. With a variety of boutique amps as well as classic mainstream models in our collection, we didn’t expect to be as enamored of this amp as we are. Damn. Where did we leave the checkbook? The Fender ‘57 Pro is not exactly a feature packed amp, however the features it does possess are very important to the overall user experience. Starting with the control array, we have five knobs labeled Presence, Bass, Treble, Instrument Volume, and Mic Volume. The top panel is rounded out with four ¼” inputs (two for instruments and two for mics), an On/Off and Standby switch, and a lamp. The guitar and mic inputs have the same impedance as each other, but the secondary inputs for each have -6dB lower sensitivity to provide a cleaner response depending on your selected instrument and its choice of pickups. Bear in mind, this amp harkens from a different era, when players sometimes had to run their mics into their instrument amplifiers. Today, we tend not to do that, but you can still experiment and use the additional inputs for a slightly different sound. Besides needing an XLR-to-quarter-inch adapter—in which case you might risk some grounding issues and a frightening electrical shock, your voice doesn’t belong inside your electric guitar amp—unlike Fender’s purpose-built, acoustic guitar amps that include XLR inputs and true microphone channels. The amp weighs in at 51lbs., surely due to the massive 15” Eminence speaker (a minor but necessary deviation from the original), solid pine construction, and Schumacher transformers. 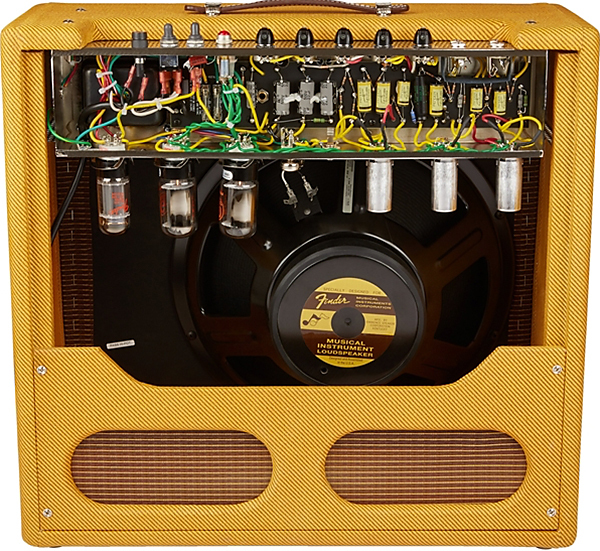 Great attention has been given to detail, and this is apparent in the hand-wired design and use of classic, yellow coupling capacitors. At 26 watts, the amp is somewhat hamstrung from the potential of its two 6L6 power tubes. Either a blessing or a curse—application depending, an added benefit of the low output wattage is enabling the amp to be driven harder at a somewhat lower volume. A 12AY7 and two 12AX7 preamp tubes, as well as a 5AR4 rectifier tube, round out the tube compliment of the amp. We could not overlook the timeless, classic tweed covering and the solid pine construction of the amp. It is a gorgeous touch that will bring retro class and elegance to any stage or recording session. We also love the tan cover, which was included with the amp. It gives the amp a classy appearance even when not in use. We would have really loved a nice spring reverb circuit to round out the feature set given how much we happen to adore Fender’s spring reverb… but that wasn’t around in 1957, and this is a faithful reissue. 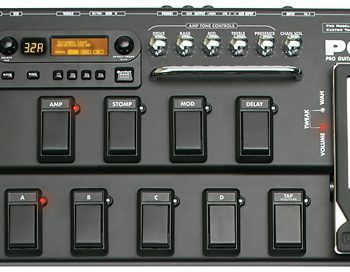 Would it be sacrilege to couple an Eventide or TC Electronic digital reverb with this thing? We could not have asked for an easier amp to use. We simply connected to power, selected an input (any of the four worked fine), and used a Fender instrument cable supplied with our Fender Johnny Marr Signature Jaguar. We found the taper of the top panel knobs to have reasonable values and they adjusted incrementally at fair intervals. It was easy to dial in comfortable listening levels. The amp does not have a particularly large footprint and worked well in our studio. It does, however, have considerable weight. We understand great sounding components are not always the lightest, but the aging bluesman might end up nursing a sore back after loading and unloading this amp from the back of his ‘57 Chevy. Luckily, we aren’t that old yet, so this was a non-issue for us. Dialing in great tone was not difficult, however the tone knobs had a direct influence over the overall output level of the amp. With everything dimed, the amp was good and loud. As we dialed back tone, we did notice an appreciable loss of volume. Once again, this may or may not affect the average user, but if you haven’t used an amp with this type of circuit design, you might find the direct tone-to-volume correlation surprising. The Fender Custom ‘57 Pro reissue delivers classic Fender tone for days! A clean, unadulterated, pure tone can be inspiring. Plugging the amp in and connecting our Fender Johnny Marr Signature Jaguar, we instantly noticed the classic Fender tone that keeps these kinds of reissues so popular. Pure, glassy, and bell-like chime leaped from our fretboard, and the 15-inch speaker transmitted that with fantastic depth and overtones. Inching up the instrument volume knob on the amp past 6:00, we started to get some very pleasing breakup, pushed nicely by the Bare Knuckle single coils in our guitar. With the volume set at about 9:00, we achieved the beginning of what sounded like overdrive, albeit with the same clarity the amp previously displayed. We want to make clear, this is not a high gain amp by any measure. But we were able to achieve a little more gain than ‘50s rock calls for—but only by a little. Yes, we heard breakup, and that breakup was very musical and inspiring, however you’re only going to achieve it at the amp’s highest volume, which isn’t the real design goal. Breakup never happens at lower volumes here, and we suspect that back in the day, players would have considered that to be undesirable distortion if encountered. Eventually, though, players discovered that pushing these classic amps would lead to a great tone for the next chapter in rock n’ roll history, not to mention the next chapter in amplifier design history. And, you will discover that it all started in amps like the Fender ‘57 Pro. For our next sound test, we plugged in our D’Angelico EX-SS archtop. The dual humbuckers gave us a notable bump up in volume and presence. There was a little less of that glassy shimmer to the tone, but still plenty of brightness, and the feel of the amp was very easy to play. Many times as guitar players, we love/hate clean amps due to the fact they unapologetically expose our weaknesses in technique. 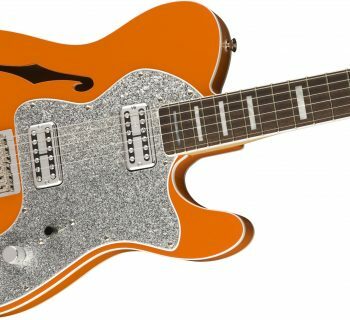 This was less apparent than we would have thought in the Fender ‘57 Pro reissue. The sound and the feel of the amp had a compressed sound to it, all the while retaining dynamic content in our playing. Our last sound test was with the Knaggs SSC. This time, we front loaded the amp with a BAE Hot Fuzz pedal. How rude of us! Once we dialed in the pedal, we were thrilled with how well the Fender ‘57 Pro Reissue served as a platform for vintage fuzz. The sound had a nice width and depth to it, and we are confident we’d be able to play any small bar gig and sound great with this setup. Video courtesy of Fender Musical Instruments Corp.
Fender documents their products to a fault. The Fender ‘57 Pro Reissue proved no different. Included was an extensive manual as well as a bonus heavy-duty handle if we chose to swap out the installed lighter one. A typical Fender limited warranty comes with the amp, but given the popularity of these amps decades later, we suspect that our new addition will outlive us and be passed down to younger family members. The Fender ‘57 Custom Pro Amp sells for $2,499.99. For a low-wattage combo amp, this price puts the ’57 Custom Pro in the boutique realm, and rightfully so. This is no mass-produced product. This is custom shop amp building. It is assembled by hand using painstakingly sourced, vintage appropriate, components. 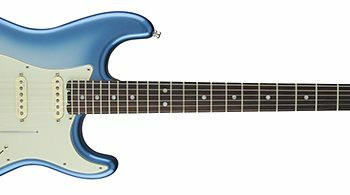 One thing we love about Fender is that they truly make a product for everyone from the beginner to the seasoned pro. This amp is obviously for the latter group, and it makes a great choice for the gigging guitarist who plays the bar scene and wants a solid, great sounding, lower-watt, clean tone, combo to raise the roof with—particularly a player who can’t be bothered with any frills or unnecessary features. Likewise, it’s an essential tool for the studio musician who may be called upon to record with classic Fender tone.